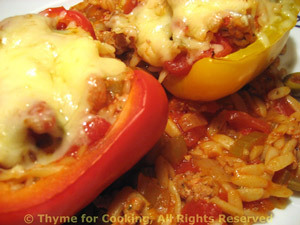 Stuffed Peppers, with Sausage and Orzo, Thyme for Cooking healthy gourmet. Sausage lends a different flavor than the traditional ground beef, and orzo a different texture. Put a large pot of water on high heat and bring to a boil. Cut peppers in half the long way (try to find the best flat sides before cutting so that they will lay nicely) and remove stem end and seeds. When water is boiling drop peppers in and simmer for 5 minutes. Remove (use tongs) and put into a baking dish that will just hold them (if possible). Keep water boiling and add orzo, cook according to package directions (usually 8 - 10 minutes) except drain when still al dente - about 1 minute less then minimum time. Drain in a strainer if your colander has big holes. Finely chop onion, celery and garlic. In nonstick skillet heat oil over medium-high heat. Add paprika, cumin, and sauté 10 seconds. Add garlic, celery and onion and sauté until transparent, about 5 minutes. Add sausage and sauté until cooked through, breaking it up as it cooks. Add tomato sauce, stock, olives and orzo. Stir will to combine. Spoon mixture into the pepper halves. Cover with foil and bake for 15 minutes at 400F (200C). Remove foil and top with cheese. Bake, uncovered for another 5 minutes. Note: If all the stuffing doesn't fit into the peppers, keep warm over very low heat while peppers bake. To serve, spoon the extra sausage / orzo onto plates, and top with peppers.